Eastern elegance, meet Western dazzle. 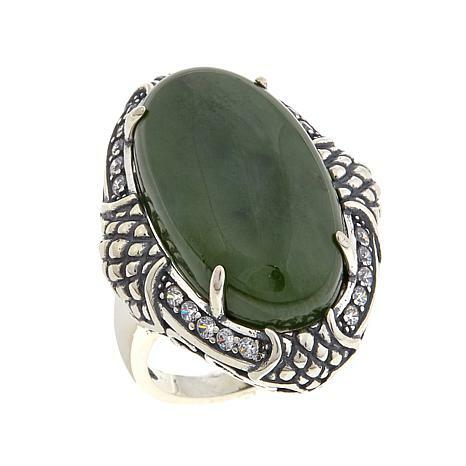 These two sides of the world come together in this sophisticated ring. 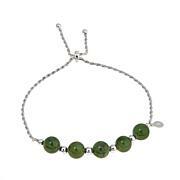 Refreshing nephrite jade combines with the alluring sparkle of CZs for a look that's an instant classic. Fusion can be fun! 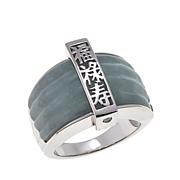 Just beautiful jade.The sizing seems to run a bit big. 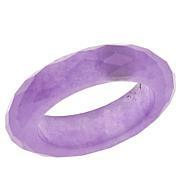 This is a lovely and well made ring. 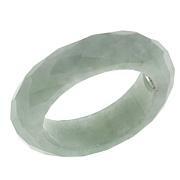 LOVE THE NEPHRITE JADE AND THIS RING IS NO EXCEPTION. GOOD DESIGN AND NICE FIT.RUNS TRUE TO SIZE AND SITS WELL ON THE FINGER. Great looking ring!! I wear it on my middle finger. I love big rings and it's big. This is a beautiful ring but I would recommend sizing down to try and avoid this top-heavy piece from rolling left and right on your finger. Im exchanging my size 7 for a size and 6 and look forward to getting this back on my hand ASAP.